I’m a big time snacker. Last year my hours working as an AmeriCorps volunteer were crazy and long and I never knew when I was going to have time to actually sit and eat something – you know, with a fork and knife. I love a granola bar just as much as the next girl but I got tired of eating the same on-the-go food day in and day out, so I vowed to find more creative and satisfying munchies that were equally convenient. I’ve collected a list of some of my favorites and thought I’d share them with you. When I set out on my quest to find a better snack, yogurt was one of the first things I turned to. I would throw all kinds of fruits, nuts, cereal, cinnamon and honey into it. 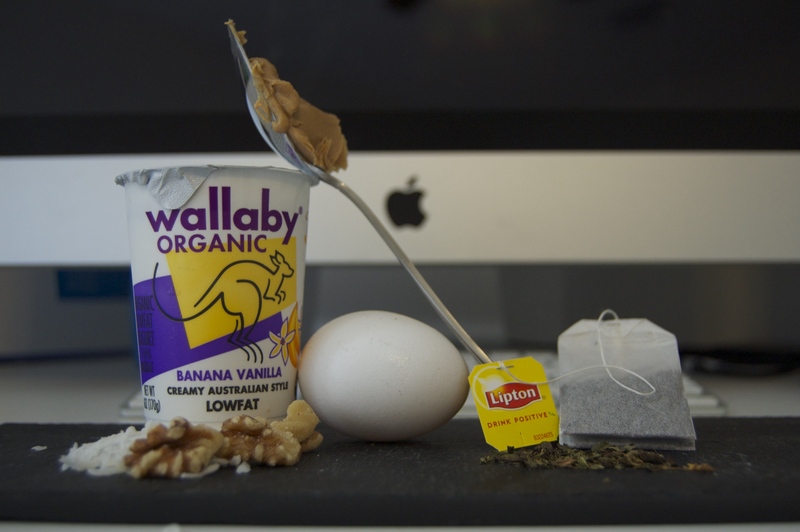 Then I found Wallaby Yogurt. To me, this is the Yogurt to end all yogurts—it’s amazing. They have great flavors (Raspberry and Banana Vanilla are my favorite) and they’re really satisfying. I like to top mine with walnuts and shredded coconut for some added texture. I realize this probably sounds like a strange snack, and it kind of is, but I promise you won’t be disappointed. I decided to start bringing scrambled eggs as a snack to work because I wanted something that would be warm and filling and quick to eat. I’d just scramble them up along with my breakfast, put them in a glass container and throw them in the fridge when I got to my office. Sometimes I got creative and added peppers or green onions too. Just pop them in the microwave and 30 seconds later your warm mini-meal is ready! Pretzels, toast, celery, the occasional Oreo—you name it, they all go with peanut butter. Sometimes if I’m really in a rush and need an extra boost of energy that I know will last, I’ll just eat a spoonful of it all by itself. This is a snack staple that’s here to stay. I know exactly what you’re thinking, “Tea isn’t a snack”. Hear me out. Not everyone has this problem but I often do; sometimes you’re in the mood to snack just for the sake of snacking. This can get tricky if you’re not hungry because you end up eating more than you’d planned and throwing your eating off for the rest of the day. I look to tea when I’m in the mood to aimlessly graze. If I’ve got work I still need to get done, I go for a black tea for a little extra caffeine, Lipton has always been my favorite, with a packet of Splenda to keep the sweet tooth at bay. If it’s later in the night and I’m looking to relax, I love Teavana’s Mint Majesty (it’s great iced too).